“My dear brothers and sisters, take note of this: Everyone should be quick to listen, slow to speak and slow to become angry” (James 1:19). Many of us struggle with fully and attentively listening to what other people are saying. We tend to brashly speak what we think right before we’ve either heard a person out or listened to the still, small voice of the Holy Spirit. The discipline of listening can be misunderstood as passivity; however, those who’ve learned to take action with quietness have the greater advantage in wisdom and insight. Are you an inactive or active Christian? “Therefore, with minds that are alert and fully sober, set your hope on the grace to be brought to you when Jesus Christ is revealed at his coming” (1 Peter 1:13). It takes action to have a sober mind. A soberly minded believer takes the necessary action of protecting their mind and hearts from the influences of the world. They aren’t passive about what they allow to infiltrate their minds through mediums of social media, TV, or movies. Being sober is setting a high standard of morality and integrity in the spirit, mind, and body. “Be alert and of sober mind. Your enemy the devil prowls around like a roaring lion looking for someone to devour” (1 Peter 5:8). A passive attitude about the devil will always lead to his entrapments; however, being overly attentive to him can cause a believer to shift their focus off of God’s power. The action needed for the Christian is to never let their guard down when it comes to Satan. We are aware of the tactics and temptations he has used on us in the past—so we stand at alert as good soldiers of Christ. “Fight the good fight of the faith. Take hold of the eternal life to which you were called when you made your good confession in the presence of many witnesses” (1 Timothy 6:12). We take action not only against Satan, but our own desires of the flesh that long to be fulfilled. As followers of Christ, we must be vigilant about our sanctification—that is, being set apart for God’s purposes rather than following the dictates of our own will and passions. Fighting the good fight of faith can’t be avoided when we desire to grow up spiritually and know Christ more intimately. There’s great joy in living a life filled with God’s purposes and direction as we take action in steps of faith. While many people may believe that prayer is passive—it’s one of the greatest actions a believer can incorporate into their daily life. Prayer is our participation in breaking down the spiritual barriers built up by Satan to kill, steal, and destroy other people. When we actively and regularly engage in prayer, our faith is broadened, tested, and stretched to ask for the greater blessings of God on our lives and for those we intercede for. “Be faithful, even to the point of death, and I will give you life as your victor’s crown” (Revelation 2:10). Believers who take action for the body of Christ are typically faithful to God’s calling on their lives. The faithful keep doing the will of God even when it gets tiring, overwhelming, and frustrating. Christians who keep showing up and working everything as to the Lord will experience His peace and presence in greater measures. “Remind the people to be subject to rulers and authorities, to be obedient, to be ready to do whatever is good” (Titus 3:1). 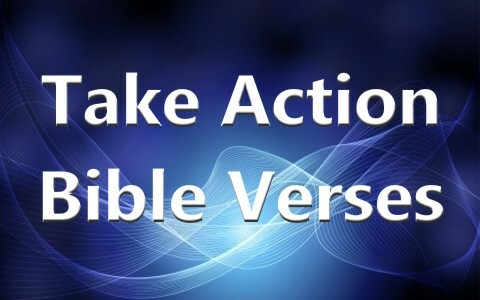 Believers must take action in being ready for every good work the Lord lays before them. A readiness of spirit and mind is most evident in those who’ve immersed themselves into the word of God. They are ready because they know the promises of God and step out in faith based on their belief in Him. No one can really be ready at the last minute. We must prepare our minds before the intense spiritual battles that lay ahead with the knowledge and application of God’s word. Are you an inactive or active Christian? Have you found yourself lacking in any of the 7 verses below? Don’t worry…take action today in your spirit, mind, and body by laying hold of the high calling of God on your life. You will never regret it. While I was watching “killing Jesus” I have overcame with strong presence of emotions. I felt a sense of able to forgive because it’s all a part of loving unconditionally. GOD IS LOVE and he has forgiven us for all of our sins. Therefore so should we. AMEN! !